Many of us are guilty of dropping flossing off the to-do list, but this automatic floss dispenser makes it easy to remember—and, more importantly, actually do it. Flosstime sticks to your bathroom mirror or tile, so it’s off the counter but in plain sight. (Reminder #1.) A touch dispenses the perfect length of floss for you, and it sets a timer for 90 seconds to make sure you do a thorough job, too. If you haven’t flossed in over a day, its light turns red. (Reminder #2.) There’s a dual mode if you want to make flossing competitive with a partner, and a sweet animal covers to encourage kids. With Flosstime helpfully nudging you along, it’s easier to be a better, daily flosser. Hi there Grommet fans! 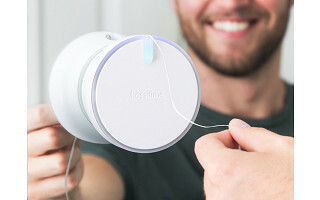 I'm Duc T. Duong, Founder and President of Flosstime Inc. On behalf of Flosstime, I am incredibly proud and excited to introduce the first automated floss dispenser that will create healthy flossing habits for your entire family! Many technologies and solutions today cater to medical treatment, instead of prevention. We passionately believe that incremental improvements and good daily habits are the key to longterm health. That's why we created Flosstime! Question: Can I wind my own brand of floss onto the dispenser or do I have to use yours only? @Linda That's a great question Linda! The replacement cartridge comes with rollers and gears that's engaged to the motor so you would have to use our own cartridges. If you're savvy though, there's a way to replace the floss on the inside with your own using a pair of tweezers. 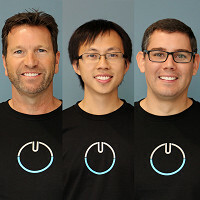 However, we test every single cartridge that we ship and we cannot guarantee that any off-the-shelf floss will work since they all have different dimensions and elasticity. What brand of floss are you using in the floss dispenser? Hi @Suz ! Flosstime comes with a high-quality PTFE floss that is very similar the Oral-B Glide. We hate when floss shreds and gets stuck in between your teeth so we made sure to never let that happen to you! I was ready to purchase until I saw that I could not use my chosen floss - Dr. Tung's Smart Floss. That's a deal breaker. I LOVE the concept of Flosstime! Make it so I can pop in my own floss and I'm all in!! Is your floss biodegradable and environmentally friendly? How much floss is in the dispenser, and how much is in the refill? Depending on how cost effective this is,I think your product is fabulous. If I order it will be my first on Grommet. thanks! Thank you for your enthusiasm @laurie ! The dispenser comes with 50 meters (54.7 yards) of floss and it will last 1 person about 3 months if you floss everyday. The replacement cartridges costs $5.95 each and comes with the same amount of floss. Hope this helps to bring you across the finish line! seems like a lot of trouble to try and put my own floss in replace of. I like my own floss and if you start to use that product that would be perfect. I do not like wax or plain, thin or wide floss. Hi @Luci ! We definitely appreciate your feedback and are working to offer more types of floss. Just for our own knowledge, what kind of floss do you prefer? How long does one roll of floss last if one person flosses daily? Great question @Marie ! Each roll of floss is about 50 meters (54.7 yards) and lasts 1 person 3 months if you floss everyday. 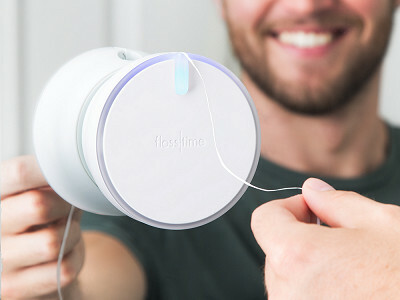 Many of us are guilty of dropping flossing off the to-do list, but this automatic floss dispenser makes it easy to remember—and, more importantly, actually do it.